View of the Great Bath, part of the Roman Baths complex, a site of historical interest in the city of Bath, England. The baths, based on the local hot springs, were built during the Roman occupation of Britain and has become a major touristic site. English : View of the Great Bath, part of the Roman Baths complex, a site of historical interest in the city of Bath, England. The baths, based on the local hot springs, were built during the Roman occupation of Britain and has become a major touristic site. English : Crash testing for ANCAP. Filmed on various generations of Phantom high speed cameras at 1000 fps. Azud del Oro bridge and The Agora , City of Arts and Sciences, Valencia, Spain. English : Azud del Oro bridge and The Agora , City of Arts and Sciences, Valencia, Spain. Round view of the Basilica of Our Lady of Perpetual Help and St. Mary Magdalene, commonly known as Collegiate church, is located in the center of Poznań, Poland. The baroque parish church is also Collegiate of Stanislaus of Szczepanów. The construction of the temple began in 1651 and took half a century until it was consecrated unfinished in 1701, and had to undergo a reconstruction in 1780 after its destruction in 1773. English : Round view of the Basilica of Our Lady of Perpetual Help and St. Mary Magdalene, commonly known as Collegiate church, is located in the center of Poznań, Poland. The baroque parish church is also Collegiate of Stanislaus of Szczepanów. The construction of the temple began in 1651 and took half a century until it was consecrated unfinished in 1701, and had to undergo a reconstruction in 1780 after its destruction in 1773. Dome of the entrance hall (also known as the Staircase Hall), National Gallery, London (England). The National Gallery was founded in 1824 and has a collection of over 2,300 paintings from the mid-13th century to 1900. The present building in London's Trafalgar Square is the third to house the National Gallery, and was designed by William Wilkins from 1832–38. The Staircase Hall was designed by Sir John Taylor in 1884–7. English : Dome of the entrance hall (also known as the Staircase Hall), National Gallery, London (England). The National Gallery was founded in 1824 and has a collection of over 2,300 paintings from the mid-13th century to 1900. The present building in London's Trafalgar Square is the third to house the National Gallery, and was designed by William Wilkins from 1832–38. The Staircase Hall was designed by Sir John Taylor in 1884–7. English : Song of Rinjani scops owl (Otus jolandae) from Sapit, Lombok, Indonesia. Dome of the old Chapter House, better known as the Holy Chalice Chapel, because there supposedly the Holy Chalice is exhibited. The chapel is part of the Metropolitan Cathedral–Basilica of the Assumption of Our Lady of Valencia, a Roman Catholic parish church in Valencia, Spain. The cathedral was consecrated in 1238 and dedicated by order of James I the Conqueror to Saint Mary. The chalice kept in this chapel has been defended as the true Holy Grail; indeed, most Christian historians declare that all their evidence points to this Valencian chalice as the most likely candidate for being the authentic cup used at the Last Supper and was actually the official papal chalice for many popes, and has been used by many others, most recently by Pope Benedict XVI, on July 9, 2006. The chalice dates from the 1st century, and was given to the cathedral by king Alfonso V of Aragon in 1436. English : Dome of the old Chapter House, better known as the Holy Chalice Chapel, because there supposedly the Holy Chalice is exhibited. The chapel is part of the Metropolitan Cathedral–Basilica of the Assumption of Our Lady of Valencia, a Roman Catholic parish church in Valencia, Spain. The cathedral was consecrated in 1238 and dedicated by order of James I the Conqueror to Saint Mary. The chalice kept in this chapel has been defended as the true Holy Grail; indeed, most Christian historians declare that all their evidence points to this Valencian chalice as the most likely candidate for being the authentic cup used at the Last Supper and was actually the official papal chalice for many popes, and has been used by many others, most recently by Pope Benedict XVI, on July 9, 2006. The chalice dates from the 1st century, and was given to the cathedral by king Alfonso V of Aragon in 1436. Comprehensive view of the waterfalls over the Basaltic Prisms of Santa María Regla, Huasca de Ocampo, State of Hidalgo, Mexico. English : Comprehensive view of the waterfalls over the Basaltic Prisms of Santa María Regla, Huasca de Ocampo, State of Hidalgo, Mexico. English : Moon Phase and Libration, from the Other Side: A virtual telescopic view of the Moon from its far side, with the Earth looming in the background. The camera is fixed to the Earth-Moon line. The Torreón Malladeta (Malladeta Keep) is a keep located over Paradise beach in Villajoyosa, in the coast the province of Alicante, Valencian Community (Spain). The keep has an oval-shaped base and was built by a rich family (Esquerdo) at the end of the 19th century inspired by the coastal keeps of the 16th century. English : The Torreón Malladeta (Malladeta Keep) is a keep located over Paradise beach in Villajoyosa, in the coast the province of Alicante, Valencian Community (Spain). The keep has an oval-shaped base and was built by a rich family (Esquerdo) at the end of the 19th century inspired by the coastal keeps of the 16th century. English : Timelapse of a thunderstorm and lightning over Johannesburg, Gauteng, South Africa. Altja river in Lahemaa National Park, Estonia. English : Altja river in Lahemaa National Park, Estonia. English : Fourteen suffragettes leave Newark, New Jersey, to protest for the women's right to vote in Washington (1913). A White Tiger in Touroparc Zoo, France. English : A White Tiger in Touroparc Zoo, France. English : The Song to the Moon from act 1 of Antonín Dvořák´s Rusalka (1901, Op. 114), sung in German by Czech soprano Emmy Destinn. Performed 9 March, 1915, in Camden, New Jersey, USA. Argiope pulchella is a species of Orb-weaver spider. The small spider shuddering on her leg is a male. English : Argiope pulchella is a species of Orb-weaver spider. The small spider shuddering on her leg is a male. Panoramic view of Victoria Harbour from Victoria Peak, Hong Kong. English : Panoramic view of Victoria Harbour from Victoria Peak, Hong Kong. View of the Carina Nebula or NGC 3372 taken from the Astronomy Observatory of Los Molinos (OALM) located in Montevideo, Uruguay. English : View of the Carina Nebula or NGC 3372 taken from the Astronomy Observatory of Los Molinos (OALM) located in Montevideo, Uruguay. English : Yusheng, a traditional raw fish salad, being prepared and tossed during the Chinese New Year season at Café Mosaic in the Carlton Hotel, Singapore. View of the casinos from the Science Center, Macau, China. English : View of the casinos from the Science Center, Macau, China. English : Animated sequence of a race horse galloping. Photos taken by Eadweard Muybridge (died 1904), first published in 1887 at Philadelphia (Animal Locomotion). Watermill in Põlva County, Estonia. English : Watermill in Põlva County, Estonia. English : Man welding a metal structure in a newly constructed house in Bengaluru, India. Chital (Axis axis) stag attempting to browse on a misty morning in Nagarhole National Park. English : Chital (Axis axis) stag attempting to browse on a misty morning in Nagarhole National Park. Umbrella arrangement over the Souq Waqif market, near the center of Doha, Qatar. English : Umbrella arrangement over the Souq Waqif market, near the center of Doha, Qatar. English : Shown here is the thermal motion of a segment of protein alpha helix. Molecules have various internal vibrational and rotational degrees of freedom. Church of St John the Baptist in Kerch, east of Crimea. English : Church of St John the Baptist in Kerch, east of Crimea. English : A Sunday of biking in Paseo de la Reforma, Mexico City, and the use of a Ecobici bicycle sharing system. Phalanta alcippe, Small Leopard, is a butterfly of the Nymphalid family found in Asia. English : Phalanta alcippe, Small Leopard, is a butterfly of the Nymphalid family found in Asia. English : African penguins (Spheniscus demersus) in the zoo of Wuppertal, Germany. View of the north of the Lake Skadar National Park, Montenegro. English : View of the north of the Lake Skadar National Park, Montenegro. English : Tallinn's Upper Old Town. English : Launching and short flight of glider DFS SG 38 Schulgleiter with a bungee cord on Wasserkuppe, the mountain in Hesse, Germany. Nature reserve “Am Enteborn” in Dülmen, Germany. English : Nature reserve “Am Enteborn” in Dülmen, Germany. English : Train of company ZSSK with locomotive ČSD Class S 499.0 departs from Bratislava main train station, Slovakia. The Hemisphere, City of Arts and Sciences, Valencia, Spain. English : The Hemisphere, City of Arts and Sciences, Valencia, Spain. English : Aerial recording of Piz Surgonda (3196 m, Bivio/Bever, Grisons, Switzerland). Gniezno Cathedral, where 6 kings of Poland were crowned between the 11th and 14th centuries, Gniezno, first capital of Poland. English : Gniezno Cathedral, where 6 kings of Poland were crowned between the 11th and 14th centuries, Gniezno, first capital of Poland. Bayon, Khmer temple constructed in the late 12th or early 13th century and located in the ancient city of Angkor, today Cambodia. English : Bayon, Khmer temple constructed in the late 12th or early 13th century and located in the ancient city of Angkor, today Cambodia. English : Fifty years ago Ranger 9 purposefully crashed into the Moon within the crater Alphonsus. Interior of Herzogenburg Abbey Church, Lower Austria. The foundation stone for the abbey as it is today was laid on March 25th, 1714. English : Interior of Herzogenburg Abbey Church, Lower Austria. The foundation stone for the abbey as it is today was laid on March 25th, 1714. Sunrise at Kõnnu Suursoo in Põhja-Kõrvemaa, Estonia. English : Sunrise at Kõnnu Suursoo in Põhja-Kõrvemaa, Estonia. English : Asian Comma butterfly (Polygonia c-aureum) filmed in a park in Tokyo on 22 March 2015. Mercedes-Benz showroom in Munich, Germany. English : Mercedes-Benz showroom in Munich, Germany. English : Three minutes after assassination of Boris Nemtsov (27 February 2015) in Moscow. Bolshoy Moskvoretsky Bridge (from 0:43) and the place of assassination (0:49–0:50) near orange cleaning car. The video made from standard video recorder. View of the Pont de la Margineda, a bridge located in Santa Coloma d'Andorra, Andorra la Vella Parish, Andorra. The bridge was built in the 14-15th century and spans the Gran Valira river (biggest in the country). The archstones are pumice, to keep the structure light whereas the walls are made of granite. English : View of the Pont de la Margineda, a bridge located in Santa Coloma d'Andorra, Andorra la Vella Parish, Andorra. The bridge was built in the 14-15th century and spans the Gran Valira river (biggest in the country). The archstones are pumice, to keep the structure light whereas the walls are made of granite. English : A flight around the Roman Rock Lighthouse just off Simonstown harbour in South Africa. This aerial media file was submitted as part of the Wiki From Above competition. Morača river, near the road from Podgorica to Serbia, Montenegro. The river is the most relevant one in Podgorica, capital of Montenegro. English : Morača river, near the road from Podgorica to Serbia, Montenegro. The river is the most relevant one in Podgorica, capital of Montenegro. English : Solar eclipse of 20 March 2015 as visible in England. North transept (with the north wall in the center) of Salisbury Cathedral in the city of Salisbury, Wiltshire, England. An Anglican cathedral, Salisbury's is one of the leading examples of Early English architecture. The canopy on the left is dedicated to John Michael Peniston (a Salisbury architect), in the tomb in the center lies Bishop John Blyth (Bishop of Salisbury between 1493-1499) and the statue on the right honors the historian Richard Colt Hoare. The cathedral was consecrated in 1258 and its spire is the tallest in the United Kingdom. English : North transept (with the north wall in the center) of Salisbury Cathedral in the city of Salisbury, Wiltshire, England. An Anglican cathedral, Salisbury's is one of the leading examples of Early English architecture. The canopy on the left is dedicated to John Michael Peniston (a Salisbury architect), in the tomb in the center lies Bishop John Blyth (Bishop of Salisbury between 1493-1499) and the statue on the right honors the historian Richard Colt Hoare. The cathedral was consecrated in 1258 and its spire is the tallest in the United Kingdom. 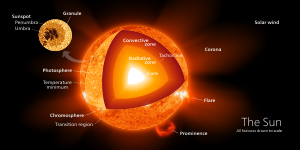 English : Diagram of the Sun. English : A four-stroke engine showcased during the Paris Motor Show (2014).